The pocket guide was a lot easier to find this year, though I didn't tend to use it. I has already added my sessions to my Outlook Calendar and then synched that with my SmartPhone, so I was operating off my SmartPhone. The problem with that is that many of the room locations had changed since I had originally scheduled my sessions. So I spent a good deal of time going to the wrong location, then looking for an updated session list so I could find the new location, and then going to the new location. I don't think the maps were particularly better this year, but the labeling of the classes was much better. If they do hold the event here again, they really need to do something about the maps. What I'd really like to see are kiosks where people can walk up and check the current schedule (live), find the location, and then since the kiosk should know where it's location, it could provide directions to the class location. Along those same lines, provide a web site with the same information, make it accessible to a variety of devices, and extend the wireless access to cover the entire conference center. Those of us who are carrying wireless devices could access the information directly that way. 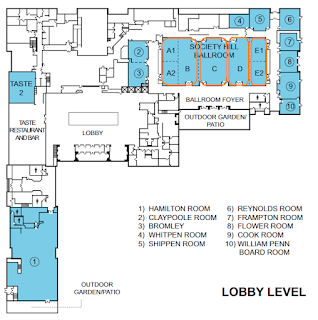 The location where you picked up the hard copy of the education session materials was better marked and located than last year, but could still be improved. On the other hand, the location of the iAnywhere lounge was a mistake. It was located next to the wireless access area, so I just assumed it was alternative seating for the folks using the wireless. It wasn't until after the conference that I realized why Breck Carter was spending so much time there. Speaking of wireless, I'd like to see the wireless connectivity extended to cover a much larger area. I seem to remember that when we were in Orlando we could use the wireless connection from the room where the keynotes were held and in most of the rooms where sessions were held. Seemed to be less noise during the sessions and the keynotes than last year. Perhaps somebody complained. No strange charges on my hotel bill this time. Perhaps somebody complained about that as well. Still need to do something to boost attendance at the ISUG Enhancements Session and the ISUG Meeting. Prized were given out at the ISUG Meeting, but I'm not sure anyone knew in advance that was the case. In any event, food seems to be an even bigger draw than prizes. I guess most folks figure they don't stand much of a chance of winning a prize, but if food is made available then everybody gets some. I tend to think of TechWave as the place where Sybase makes a lot of new announcments about their products. Last year was a really focused on the release of ASE 15. This year there didn't seem to be a lot of news. Sybase did announce a couple of new products (and some of you may remember how I feel about the number of products they already have!). There wasn't that much in the way of announcements for existing products. PowerDesigner 12 and SQL Anywhere 10 had already shipped, so announcing them wouldn't have been much news. (They did in fact release a press release on SQL Anywhere 10 during the conference, but I don't remember it meantioned during the keynotes.) EAServer 6.0 did go GA about the same time as the start of TechWave, but you didn't hear a word about it. The PowerBuilder demo they did during the keynote was essentially for PB12, and they really didn't discuss it otherwise. Nor did they really say much about PB11. Workspace 1.5 had already been announced at JavaOne back in May, so there was no point announcing it again. So, if you came looking to see dramatic announcements or demonstrations of new features in the works, you would probably be disappointed. On the other hand, the Workspace folks did manage to tweak the PowerBuilder developers in the audience a bit by referring to Workspace as "The future of development." That's actually the mantra that is repeated in the ISUG webcasts on Workspace. That's one of the problems with having too many tool with overlapping capabilities, you end up with products that compete with each other. They did split up the keynotes to different days, but then they expanded the content so they took up more time. I'd have to argue for splitting them up again. Shorter more focused keynotes spread out throughout the conference. Perhaps one in the morning and one in the afternoon and have them run throughout the conference, not just the first two days. Of course, they would then have to run concurrently with some sessions. Perhaps one keynote per "track", which would mean roughly four convering less ground each, and try to schedule it so that so sessions for that track are going on during the keynote for that track. It would also help if the keynote did a little more to pull in the audience. John Strano did that a bit by questioning an audience member for data during his demo. The roundtables are good, but perhaps the audience should be able to ask questions as well. Submitted in writing though: I remember an ex-Sybase employee getting the floor when they were taking questions live during a keynote a few years ago and it wasn't pleasant. I've mentioned it bit in my previous discussions of TechWave. I'm no big fan of Las Vegas. Particularly since they dropped the "Family Friendly" emphasis and shifted to the "What happens in Las Vegas stays in Las Vegas" emphasis. Las Vegas may be a favorite location for a lot of folks in Los Angeles (where I'm located) to do a weekend trip to, but I'm not particularly sold on it as a location for a business conference. I'd much prefer San Diego or Anahiem as a West Coast location and Orlando as an East Coast location (so long as we avoid hurricane season). We should have a more family (and pocketbook) friendly special event as well.